Image from page 5 of “quad fold” for US Army TRADOC PAM 525-3-1. I recently listened to Lieutenant General HR McMaster speak at the Carnegie Council for Ethics in International Affairs. Note that this program is available in podcast via iTunes and you should download it and listen to it (now) as I can affirm it will be worth your time. In fact, to be honest, I listened to it twice because I felt like there were some things that I missed and wanted to hear again. He’s smart and engaging which is something rare in security circles. I find that listening to podcasts often creates portals to other ideas – gateways to knowledge that I otherwise would not have been able to come into contact with. Lieutenant General McMaster referred to some of the things his organization (Army Capabilities Integration Center; ARCIC) is doing to prepare for future warfare, including a specific description of the types of ways hybrid actors seek to use force. This idea was more fully described in an ARCIC “quad fold” document, which I’ve taken a screen shot of above. This quad fold is an example of doctrine writing that begs for improvement. For these ideas to be truly useful for human beings we should use the elements of eloquence to make dynamic doctrine. 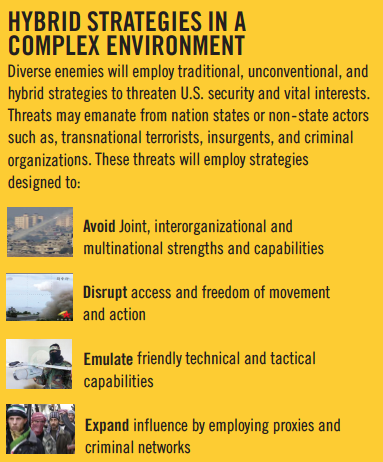 Hybrid Enemies tend to Employ strategies designed to Evade, Exclude, Emulate, and Expand. PreviousArt of Future Warfare: What might the next Great Power War look like?